One of the handy things about jailbreaking is that some of the great ideas featured on other smartphone devices can be ported over to iOS, such as Android’s connect-the-dots unlocking mechanism, which found a way to iDevices through the AndroidLock tweak. What with everything tech being covered by patents, Apple is not necessarily able to add every good trait from other smartphones on the market due to the threat of a potential court case, so we rely solely on the devs and hackers to do this for us. 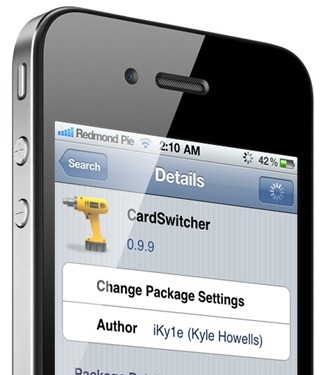 Our latest featured Cydia tweak poaches a novel idea from HP’s webOS carcass in the form of CardSwitcher. Switching between apps on the iPhone, iPad and iPod touch can be something of a pain, and this particular tweak allows you to swipe between apps effortlessly, as if they were tabs in Mobile Safari in a smooth, credit card-like interface. As is the case with many Cydia apps and tweaks, there is no Springboard icon in CardSwitcher, so you’ll have to tailor the experience in the Settings app. Unfortunately, this is not yet available for the iPad, so those looking for some quick-fire switching on the tablet device will have to wait. You can follow the developer and designer Kyle Howells a.k.a iKy1e on his Twitter page to keep yourself updated. Having tested it on an iPhone 4 running iOS 4.3.3, I can confirm that it works as advertised, and makes the iExperience less cluttered, as well as more sophisticated and productive. You can grab CardSwitcher from the BigBoss repo for $1.99, and we must say that the price justifies the functions it performs. In order to use CardSwitcher, you will of course need a jailbroken iPhone, or iPod touch. You can follow our step by step guide posted here to jailbreak your iPhone, iPad or iPod touch on iOS 4.3.5 using Redsn0w (or PwnageTool), or on iOS 4.3.3 using Redsn0w, PwnageTool, Sn0wbreeze & JailbreakMe (that last one being the easiest).